Asthma is a common childhood disease. Its occurrence varies from one place to another, the frequency of which differs between age group. These maps show the spatial variation of severe asthma cases projected from a series of studies conducted on kindergarten children (age 4-6) and adolescents (age 13-15). Apparently severe asthma is common in younger children. 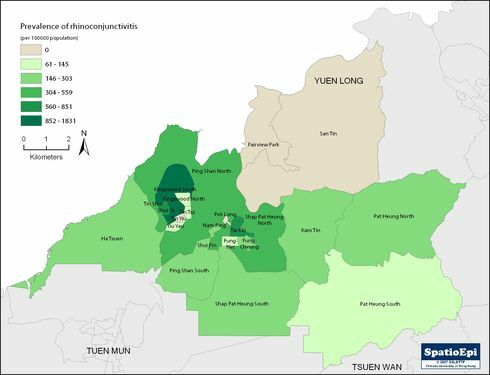 Data in the maps were obtained from a study in Hong Kong (Professor Gary Wong, The Chinese University of Hong Kong.) under the auspices of the International Study of Asthma and Allergies in Childhood (ISAAC) in 2002/ 2003. 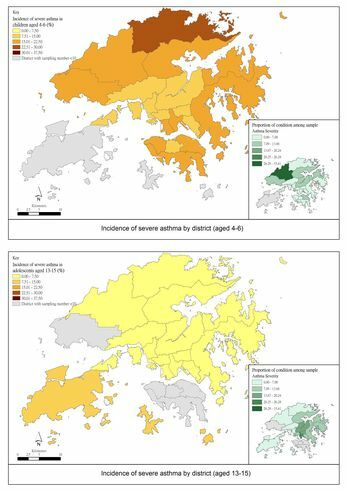 Top map shows the incidence in percentage of severe asthma of children at age 4-6 while the bottom map age 13-15 illustrated by districts in Hong Kong. The smaller maps indicate the proportional distribution of study cases by districts. The darker colour means a higher incidence. In addition, the North district gave the highest incidence of severe asthma in children at age 4-6 compared to other districts. Asthma is a common allergic respiratory condition which involves constriction as well as inflammation of airways lined with excessive amount of mucus in response to certain triggers. These environmental stimulants can be allergen, hot and cold air, tobacco smoke, exercise and exertion, or even emotional stress. Sometimes common cold can trigger symptoms of asthma in people predisposed to the condition. There is an increased awareness of asthma in developed countries where the reported incidence of childhood asthma has been rising. Similar pattern has started to emerge in developing countries.